Pressure washers are incredibly powerful tools, and if used incorrectly they can cause expensive damage to vehicles and serious physical harm to users. Nilfisk discusses the risks and explains just how to get it right. 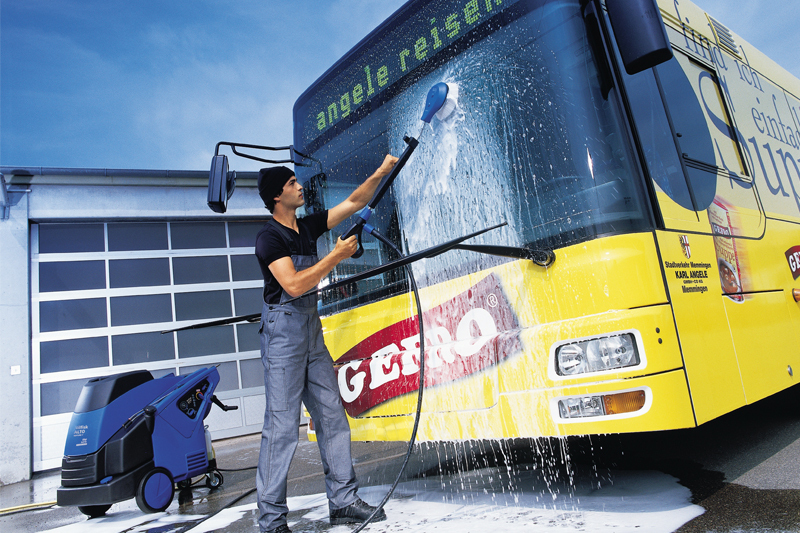 Constant vehicle cleaning can be a bind, but a sparkling fleet is expected, while returning a spotless vehicle after repairs will add value to workshop businesses. Insurance costs also continue to escalate, so it is imperative that no damage is caused to vehicles during the cleaning process. Here, Nilfisk offers its top tips on how to avoid disaster. It is critical that as much dirt as possible is removed before any hands are placed on the vehicle. Any particles dragged along the surface of the vehicle can damage the paint work. A pressure washer is ideal for this, but users should be careful not to stand too close – a minimum distance of 30cm is ideal. It is also good practice to always point the water hose to the floor, in order to stabilise the force of the flow before contact is made. If the water pressure is too high to start with, you may cause damage before you realise. Pre-spraying with a detergent liquid or foam is recommended and will help the dirt come away quicker. It must be noted that a pressure washer should never be used on paintwork that is flaking or rusty! Most of the time cold water delivered at pressure will do the job, but if oil or grease is present, hot water will be much faster and cost effective. Independent tests have proven that cleaning time, and the associated labour cost, can be significantly reduced if hot water is used. Whole life running costs, including purchase price, labour, water, fuel and service elements can be reduced by 26% compared to cold water only. When selecting hot pressure washers, look for models with eco-friendly boilers, as power consumption will be significantly lower. The Nilfisk MH range provides up to 210 bars of pressure at 90 ̊C and heats the water with EcoPower boilers that are recognised and approved by EUnited. An EcoMode function allows cleaning at 60 ̊C, resulting in further fuel savings. Using the right attachment can be vital in removing excess dirt. A soft, long bristled brush is ideal for the bodywork, whilst a rotary brush will assist in getting into awkward areas like front grills, bumpers and wheels. A detergent nozzle will allow you to spray the vehicle with a mixture of water and mild pressure washer detergent. This tool is particularly good at cutting through grime and oily stains. A wand extension will help you reach over the roof of high vehicles, in order to access the parts that often get missed by a sponge. Never use a ‘turbo’ or unrestricted nozzle on your pressure washer, as irreversible damage can occur to paintwork and rubber seals. Never point the pressure washer into the engine block or any other working components, including the vehicle aerial. Many experts agree that a well-maintained engine block encourages mechanics to take more care when servicing – but don’t clean it with a pressure washer! Alloy wheels and hubcaps are the biggest collector of grit, dust and oil from road surfaces. Begin as you would with the bodywork by using the main nozzle of the pressure washer to remove loose debris and immediate dirt. Then, use the detergent nozzle to break down oil residue and then the rotary brush to agitate the difficult stains and get into awkward corners. Rinse thoroughly with plain water to remove all excess detergent, but avoid aiming the pressure washer at the tyres, as this may risk damage to tread or the tyre wall. When choosing a pressure washer, pay attention to the machine’s centre of gravity, as it will affect how easy the unit is to pull or push, especially on uneven surfaces. Manoeuvrability is often critical within a busy workshop. 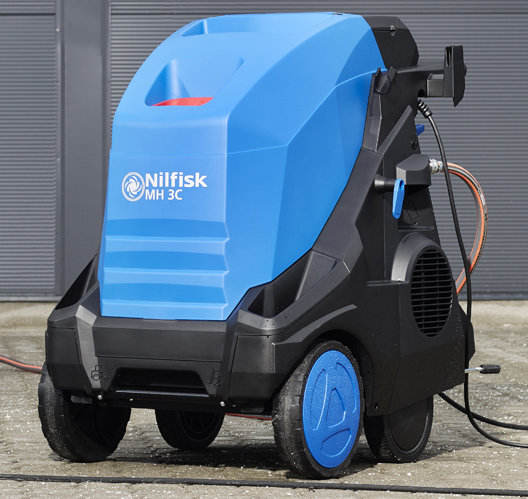 The Nilfisk MH range features a four wheel design which is very easy to tip and steer from left to right, while transport is aided by a handy footplate at the rear.